JustforJeeps.com carries a huge selection of accessories and dress-up parts for your Jeep so you can personalize the appearance of your ride. 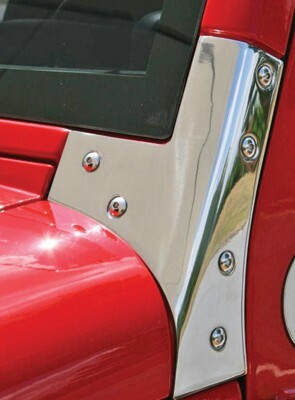 These chrome-plated stainless steel windshield brackets (part number 111203RR) bolt right on in place of the original windshield brackets on your 2007 to 2015 Jeep Wrangler to create a custom look with a splash of chrome. Because they're made of stainless steel, they'll stand up to the weather and resist corrosion. They're sold in pairs.